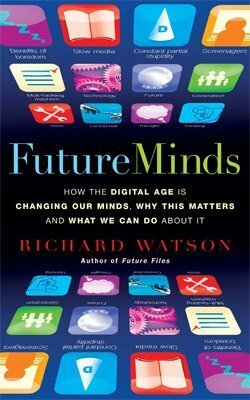 Futurologist Richard Watson warns of “screenagers” in a book which remains relevant 8 years later. Interested in reading this book? As an Amazon Associate I earn from qualifying purchases. This was not the first book I had read to make the case that technology changes the way our minds work. The Shallows by Nicholas Carr, made that case excellently when published in 2010. However it was not until last year, when wandering through a charity shop, that I discovered Future Minds, published in the same year and covering similar territory. What caught my interest was the promise of practical suggestions to combat the less desirable changes to our minds in the digital age. On this measure it is only partly successful; it is far from a definitive plan to cope in the digital age. Only one chapter is given to practical suggestions, and even then they are rather vague. For example, some of the author’s top 10 tips for deep thinking include “be patient”, “lose your inhibitions”, and “retain an open mind”. This is all good advice, but it feels like pointers in the right direction rather than a concrete solution. There’s plenty of food for thought, but no menu. What I would have preferred to see is a list of exercises one can practice. One of the few suggestions of this kind is to try doing nothing for 24 hours. I must admit I have not found the time for this yet, and it’s probably not a feasible exercise for many people, but I have been experimenting with shorter periods of nothingness and found the results to be fantastic: just 5 minutes of truly doing nothing can help me leave behind my bad habits of reacting to every distraction, and renew my focus for hours to come. A major topic of the book is the effect of digital technology on kids and teenagers (“screenagers”), and the author makes a number of common sense suggestions for parents and educators to limit screen usage and encourage creative thinking. I must admit this did not interest me much – I’m more concerned with my adult brain, but it’s certainly a topic I would think about carefully if I were a parent or teacher! The chapter on “Thinking Spaces” was certainly worth a read. I constantly underestimate the importance of environment in creating the conditions for work (and different environments for different kinds of work). Any reminder and discussion of this is helpful. My biggest criticism of the book is that it seems to be very much preoccupied with how we are “losing the ability to think in a deep, creative way”, but not other deficiencies in our thinking in the digital age such as struggling to maintain focus or follow a narrative as when we read a book or watch a film. It also has very little discussion of the way technology functions and how that might be improved to encourage healthier thinking. Perhaps the most positive side to the book is that (partly due of the lack of clear, practical instructions) reading the book becomes an act of deep thinking in itself. The reader is forced to contemplate the abstract suggestions in order to turn them into practical steps that they can apply to their own life. Perhaps that is the best we could expect from a book published only three years after the first iPhone became available. By taking this approach it still manages to be relevant, despite changes in our relationship to technology over the years, such as the accession of the iPad as a kind of substitute parent for toddlers.